A relieved husband whose wedding ring was reportedly stolen at knifepoint in Doncaster has been reunited with the treasured possession. The 74-year-old had been walking along High Street in Mexborough on Sunday, April 29 when he says he was approached by a stranger who threatened him with a knife and forced him to withdraw money from a cash machine on Main Street, before his gold wedding ring was taken. The unknown man headed towards Lower Dolcliffe Road following the alleged robbery, which happened at around 10.20pm that night. Police, who had appealed for information, say the wedding ring has since been recovered from a local pawn shop - much to the relief of its owner, who had never been parted from it during 43 years of marriage. A 28-year-old man was arrested on Wednesday on suspicion of robbery and has been released under investigation. Ben Lackenby, 22, and Kelly Hoult, 32, both of Cedar Avenue, were also arrested that day and were charged on Thursday with handing stolen goods in connection to the incident. They have also been charged with robbery in connection to an incident that is reported to have occurred on Saturday, May 5. 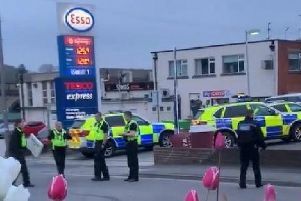 On that occasion, a 45-year-old woman reportedly had her nose broken in an assault on Wath Road in Mexborough at around 3am and was robbed of the £120 she had withdrawn from a cash machine. Lackenby and Hoult appeared at Doncaster Magistrates' Court yesterday and have been bailed until their next appearance at court.